COLD WAR is a Polish drama about the on and off romance between a female singer and a musician in Poland and France, set against the backdrop of the Cold War between the East and the West, from 1949 to 1964. COLD WAR has some interesting character dynamics and a message pointing out the evils of big government socialist oppression, but the movie could have benefitted from a more cohesive plot structure, less ambiguity, and a more inspiring tone. COLD WAR is a semi-autobiographical Polish drama about the on and off romance between a female singer and a musician in Poland and France, set against the backdrop of the Cold War between the East and the West, from 1949 to 1964. COLD WAR has some interesting character dynamics and a message pointing out the evils of big government socialist oppression, but the movie could have benefitted from a more cohesive plot structure, less ambiguity and a more inspiring tone. The movie opens in 1949 with the Communists and the Soviet Union in control of Poland. Wiktor, a musician and folklorist, roams the Polish countryside recording folk songs and dances performed by local people. The government picks Wiktor to help organize a dancing and singing folk troupe, to celebrate the heritage of the Polish people. Wiktor falls for a beautiful blonde singer named Zula, who sees the troupe as her way out of the terrible postwar poverty in rural Poland. Zula quickly becomes the troupe’s star singer. Cut to East Berlin in 1952. The troupe is making a popular tour behind the Iron Curtain, but Wiktor is upset about the Pro-Stalinist propaganda the government is inserting into the troupe’s performances. He defects to France, but Zula decides not to travel with him. Over the next five years, Wiktor finds a life for himself in Paris, mostly as a jazz pianist and film composer. Zula comes in and out of his life, but they can never seem to get together. They have different temperaments, unable to stay together yet yearning to be together when apart. Also, Wiktor is outspoken when chafing under communist rule but meek when enjoying the fruits of capitalist freedom. Meanwhile, Zula benefits from being in the spotlight in Poland, but she’s unhappy in the West, where she’s just one talented person among many. 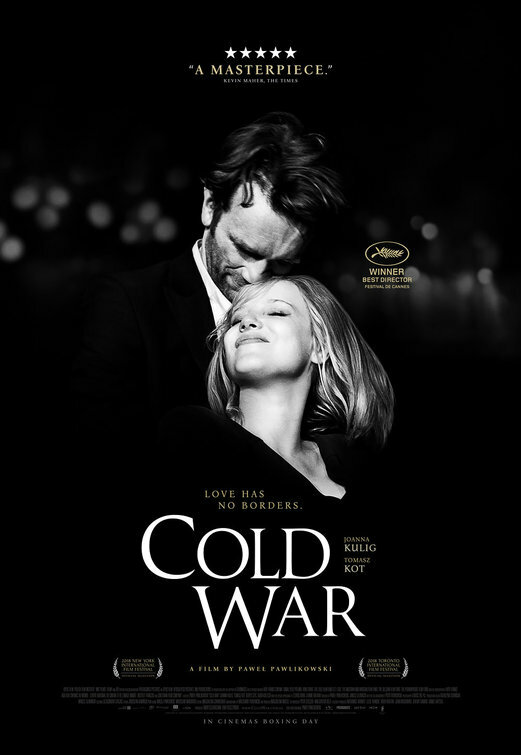 The story in COLD WAR is loosely based on the lives of Writer/Director Pawel Pawlikowski’s parents. “They were both strong, wonderful people,” Pawel writes, “but as a couple they were a never-ending disaster.” So, Pawel decided to make a movie about two incompatible people in love who can’t bear to be apart but who don’t mesh well together when they’re with one another. Of course, the problem with such incompatible characters is that their story can become annoying. That’s even more true in COLD WAR, because, while it seems clear that the man in the story wants to be with the woman, the woman never really articulates whether she truly wants to be with the man. Until the very end, it’s not obvious what exactly Zula wants. Even then, her real feelings are left unstated, though it becomes clear she does have deep feelings for Wiktor and is concerned about him. COLD WAR is not designed to be a head-on attack against the communist regime in Poland and Eastern Europe during the Cold War. Also, the benefits of Western freedom are not always clear in the movie. After all, France could be a pretty decadent country, even in the 1950s and 1960s, the time period in which the movie is set. However, the ending of COLD WAR clearly shows that, despite some possible liberalizations in the Eastern Bloc and Poland during the mid 1960s, the socialist oppression in Poland has begun to take an onerous toll on Zula, and it’s left an indelible mark on Wiktor, who returns to Poland to be with Zula but is arrested and put into prison. Ultimately, the ending to COLD WAR suggests that liberty is preferable, and that love is transcendent, despite all its challenges. That said, the movie could have benefitted from a more cohesive, exciting plot structure and less ambiguity. Also, the dominant worldview is rather amoral and not very inspiring. Wiktor and Zula are focused on seeking personal happiness as they navigate the dangers of the Cold War. They also seek and find personal worth in their individual artistic expression, even though they never seem totally happy with one another or apart from one another. All in all, MOVIEGUIDE® advises extreme caution for the Romantic, amoral perspective of the two main characters, several strong obscenities, and brief sexual situations. Communist oppression and woman abandons her communist husband and their son to escape to freedom in the West with her former lover who’s been imprisoned. COLD WAR is a semi-autobiographical Polish drama set against the backdrop of the Cold War between the East and the West, from 1949 to 1964. It’s about the on and off romance between a female singer and a musician in Poland and France. In the early 1950s, Wiktor and his protégé, Zula, find success working in a song and dance folk troupe for Poland’s communist government. However, Wiktor comes to hate the heavy-handed management of the government’s Stalinist regime. He flees to France, but Zula’s addicted to the fame she’s found in Eastern Europe. Over the years, they meet and try to come together somehow. COLD WAR has some interesting character dynamics and a message pointing out the evils of big government socialist oppression. However, the movie could have benefitted from a more cohesive plot structure and less ambiguity. It isn’t until the end that the movie’s anti-communist message becomes really clear, for example. Also, the two main characters have an amoral perspective on life and the liberty that’s available in the West. COLD WAR also contains several strong obscenities and brief sexual situations that warrant extreme caution.